Hex is a two-player abstract strategy game played on a K×K rhombus of hexagonal tiles. Two opposite sides of the rhombus are colored white, and the other two black, and the two players, black and white, take turns in placing a token of their color on an unoccupied tile. The player who first manages to construct a path between the opposite sides of their color is the winner. It is known that the game cannot end in a draw, and that the first player has a winning strategy regardless of the board size (see the Wikipedia page for details). In this challenge, we fix the board size at K = 4, and represent the board as the following grid. The thick lines denote adjacent tiles. Outline of one possible winning strategy, assuming white goes first. First select 5. After that, if you have a path from 5 to the bottom row OR black selects 0 or 1 at any point, respond by selecting whichever of 0 or 1 is vacant. 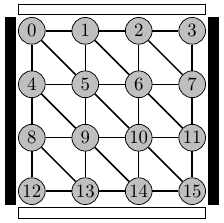 If black selects 9 or 13, select 10 and then whichever of 14 or 15 is vacant. If black does not select 9, 13 or 14, then select 9 and next whichever of 13 or 14 is vacant. If black selects 14, respond by selecting 15. Next, select 10 if it is vacant; if black selects 10, respond with 11. If black then selects 6, respond with 7, and next whichever of 2 or 3 is vacant. If black does not select 6, select it, so you have a path from 5 to the bottom row. Input from STDIN, output to STDOUT. Input as one command line argument, output to STDOUT. Input as 16 single-character command line arguments, output to STDOUT. Input as argument of named function, output as return value. A zero-based index (as used in the above picture). The input string with one E replaced by whichever of W or B you chose for your player. Your strategy must be deterministic. You are not required to correctly handle game positions that are unreachable from the empty board using your strategy, or positions that are already winning for either player, and you may crash on them. Conversely, on boards that are reachable using your strategy, you must return a legal move. This is code-golf, so the lowest byte count wins. Standard loopholes are disallowed. I have written a Python 3 controller for validating entries, since it would be extremely tedious to do by hand. You can find it here. It supports the first three input formats and Python 3 functions (functions in other languages have to be wrapped into programs), all three output formats, and both players. If a strategy is not winning, it will output a losing game it found, so you can tweak your program. This is a naive implementation of the hinted strategy in the question. It expects the board to be provided as 16 commandline/mainboard parameters like hex.mbl B W E E E W E E E B E E E E E E and it will output the zero-indexed position of white's next move. }9 B! }E E? W? E? .. E? B? B? W? .. E? .. E? ?0 ++ ?0 &9 .. &D &P &A &I /\ &J .. &E &L !! \\ .. // .. .. .. !! .. .. \/ .. \/ .. !! .. .. .. .. .. .. .. .. .. .. .. .. .. B? W! .. .. .. &S /\ &T &S &T &U E? &A &R &R !! .. .. .. !! .. .. &U /\ &V &3 .. !! .. .. .. .. .. .. .. .. .. !! I think I can probably golf about 200 characters out of this with better branching and elimination of code re-use. The strategy is to first search for a B on the board. If there is none this returns -1, which in python is the same as last index. Thus on an empty board my first index will be index=-1, which is where I start to move. If the field to my left (index-1) is free, my next move goes there. If it is taken, I go up left. I never have to move up: if I do, I lose tempo and will lose the game. On a full board (no E anywhere) I don't make a move. The print seems a bit weird at first: I have to construct the new board (which I do via slicing) but then I need to cut out 16 characters. This is a relict since I work with negative indices and b[i+1:] will thus return the hole board and the rest I expect, making it important to cut off the remainder. Another way would have been to work with positive indices, e.g. by taking (b.find('B')+16)%16, but (+16)%16 is one byte more than ()[:16]. Incorrect response 'WWWWWWWWBBBBBBBB' to message 'WWWWWWWWBBBBBBBB'. I think I either should have won after the 4th turn or answering with the same board to a full board should be a correct response. Not sure what goes wrong there, didn't dive much deeper - I just wanted to check if I got all "special" cases covered. But since I don't have to cover up situations where someone starts on space 4 or so, it doesn't matter anyway. Incorrect response 'WWWBWWWWBBBBBBBB' to message 'WWWWWWWWBBBBBBBB'. This might or might not be counted, and since I found it wasn't a valid move I decided to go for the longer but more correct answer. Not the answer you're looking for? Browse other questions tagged code-golf graph-theory board-game hexagonal-grid or ask your own question.